Yesterday Amazon revealed their new airline: Prime Air. Ok, they really announced it when they engaged in a contract for a handful of 767s. Well, Friday included the unveiling of Amazon One, including Prime Air’s livery. Amazon One, courtesy of Amazon. As you can see, the real treat is the belly of the plane, very similar to Emirates. It gets even better. 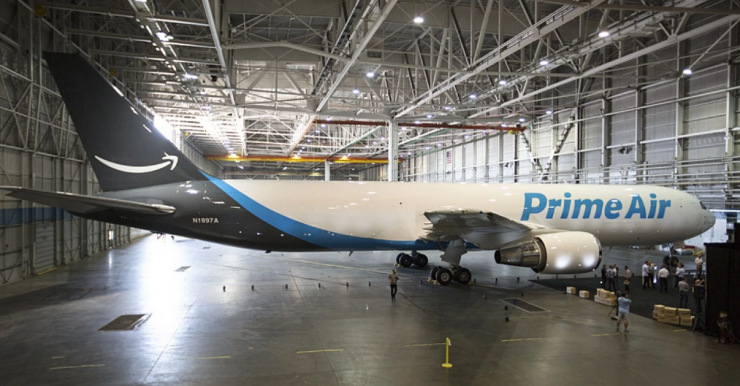 The Washington Post reports that the tail number for Amazon One is: N1997A, a prime number! The article also reports that Amazon already have 11 leased planes flying (without the livery), and will grow to 40 total aircraft. Its truly impressive, how Amazon is truly growing as a logistics provider. I think we had an idea that was the case as I posted back in March, that Amazon is focused on Global Supply Chain by Amazon. What do you think of the livery?